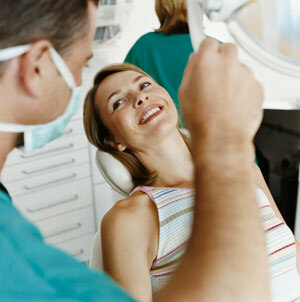 When you come into the dental office for an examination, you might assume that the focus is on your teeth. That's often correct — but don't forget that there are a number of other parts of the oral and facial anatomy that are examined as well. These include areas around and inside the mouth (such as the lips, gums, hard and soft palate, and the tongue) as well as outside the mouth (the skin, muscles and glands in the neck, and the temporomandibular joint). In fact, when it comes to detecting certain oral or systemic (whole-body) diseases, a thorough dental exam may be your first line of defense. How are diseases in the mouth discovered? Most of the time, it's simple: You will be asked about any changes you have noticed, or symptoms you may be experiencing. Your face, mouth, and neck will then be visually inspected, and certain areas may be palpated (gently touched or pressed with fingers) or probed (touched with a small instrument). If needed, additional tests or diagnostic imaging (X-rays or other methods) may be used to aid in diagnosis. Occasionally, an abnormality such as a lesion (an unusual localized change in your tissues) is found that needs to be examined further. Lesions may resemble white or red spots or lumps (tumors), but they are typically benign. However, it is often better to err on the side of caution and perform a biopsy to be sure. This may involve making a small incision and removing a part of the suspicious area. The tissue sample will be sent to a pathologist, who examines it under a microscope for signs of disease. 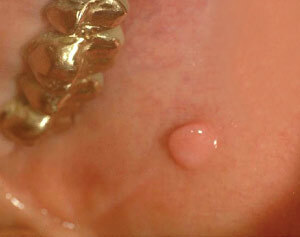 Fibroma, a thickened mass that may feel like a lump in the lining of the mouth. Leukoplakia, a condition that causes white patches to form inside the mouth. While usually benign, the lesions may be precancerous and are often biopsied. Lichen Planus, an inflammatory disease that sometimes causes discomfort. Mucous Membrane Pemphigoid, an autoimmune disease that may cause oral lesions, but is not life threatening. “Pregnancy Tumors,” benign red swellings that may form on gum tissue of pregnant women due to hormonal changes. In addition, some systemic diseases (such as diabetes, Crohn's disease, and heart disease) may produce effects that can be observed in the mouth. We are always on the lookout for signs of these potentially serious conditions. Although the majority of oral lesions are benign, if there is any possibility that the growth could be cancerous or pre-cancerous, it's likely that a biopsy will be performed. Depending on how much tissue needs to be removed, this may be a simple in-office procedure, or it may be done in a hospital setting. Typically, the procedure requires only local anesthesia, and it doesn't take long. If incisions are made, they are often closed with self-dissolving sutures (stitches) that don't need to be removed. Because the oral tissues are rich in blood vessels, some bleeding is normal for a period of time afterward. You will be given follow-up instructions as needed, including how to manage swelling and discomfort, when to take medication, and what to eat and drink. Getting some rest and maintaining good oral hygiene will also help you get back to normal as quickly as possible. When the pathology report is complete (usually in a few days), you will be given the results.